When Supergirl steps in to answer a distress call from a US Navy ship that is attacked by aliens and refuses to back-down when Colonel Haley tries to pull rank, the new head of the DEO redoubles her efforts to discover Supergirl's secret identity, starting with an intensive interrogation of all DEO personnel... including Alex! Meanwhile, Brainiac-5 attempts to get Nia Nul to embrace her powers, but she completely misinterprets his motives. Neither Supergirl nor the soldier she caught who is knocked overboard are wet when Kara drops her back on the dexk, despite the soldier having landed in the water and Kara being seen diving in after her. None of the actors can agree on whether or not Morea is prounced as "More-a", as in moray eel or "More-aye." The combat scenes with the Morae are awkward due to the inherent problems with stunt actors having to act like they've been hit by something they can't see and how incredibly low budget it looks for them to be struggling with open air. If the DEO had access to a creature like a Truth Seeker, why didn't Col. Haley start using it from the beginning instead of waiting until after the attack by the Morae? 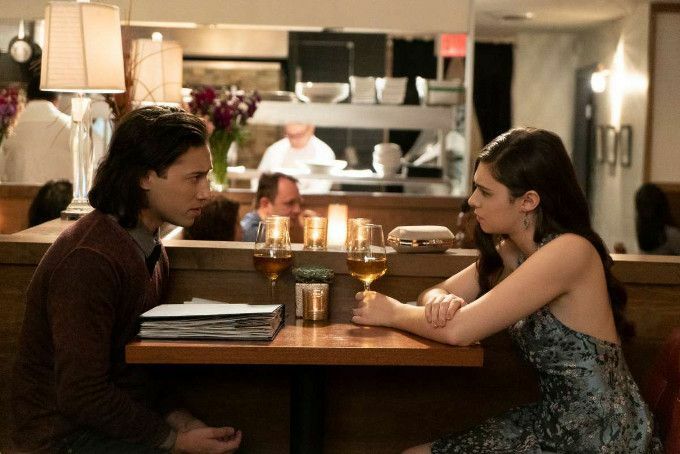 As much as I want to hate the fact that Brainiac-5 is reduced to not knowing the word "restaurant" when he's trying to talk to Nia, Jesse Rath does a fantastic job of selling his overblown awkwardness. Contrived as most of this episode is, I defy you to not feel misty-eyed at the ending as Alex volunteers to be mind-wiped to save Kara. Good show Melissa Benoist and Chyler Leigh. The opening scene with the Kaznian Supergirl training has good effects work. This episode opens with a slightly modified version of the original Season Four introduction. Now, Kara says that she works with her adopted sister to protect the Earth, with no mention of the DEO. Brainiac-5 makes reference to once having spent 18 days on the planet Venegar being tortured. In the classic Legion of Super Heroes comics, Venegar was the homeworld of the villain known as The Emerald Empress. When telling Nia that he thinks she should team up with Supergirl to help her fight crime, Brainiac-5 says she could be her Super-friend. This is a nod to the classic DC Comics themed cartoon series which ran from 1973-1986. Col. Haley says that Alex has violated Article 90 of the Uniform Code of Military Justice. This article concerns Assaulting or Willfully Disobeying A Superior Officer. One DEO agent makes reference to using RTI (Resistance To Interrogation) training to avoid cracking under questioning from Col. Haley regarding Supergirl's secret identity. Brainiac-5 claims to have reorganized his neural network to form many small compartments for storing sensitive information. He claims this makes him immune to standard interrogation tactics, as he can shut down access to these compartments at will, literally willing himself to forget. This information can be set on a time so he can recall it later. The Morae are a race of aliens with a natural cloaking power. They are said to be completely invisible but Kara is able to perceive a slight translucent shimmer. J'onn believes this may be a byproduct of her X-Rays vision and ability to perceive other wavelengths outside the visible spectrum. They are apparently able to control which spectrums they are visible in, as they are able to become invisible to Supergirl once they realize she can see them. Lena said that she had a Penicillin moment while working on the problem of curing all human disease, using a biolistic delivery system to rewrite DNA. She realized she could use this system to give humans superpowers. Brainiac-5 says the Morae's natural cloaking ability does not interact with light. In order to help the human DEO agents to perceive them, he intends to flood the HQ hallways with mist along with activate a grid of light amplification by simulated emissions of radiation (i.e. a laser grid.) Once that is triggered, he will attack the Morae with a paintball gun loaded with phosphorescent pellets. This will cause them to glow in spite of their stealth powers, making them easy targets. Level 4 of a standard DEO stun gun releases enough power to disrupt a Morae's cloaking ability without harming them. A Vertullarian is an alien creature that is commonly known as a Truth Seeker. Brainiac-5 recognizes them from the future, but says he didn't know there were any on Earth in the DEO's inventory. J'onn says there is no way to deceive one. Brainiac-5: Some would say launching a PI shingle is a bit old-fashioned. But then again, you are very old. Nia Nul: This is a nice surprise. How are you? Brainiac-5: I am calling to find out about food and your interest in it. Nia Nul: Uh - I am definitely interested in food. Brainiac-5: Would you like to eat some? Nia Nul: Now? Like, on the phone with you? Brainiac-5: (confused) What? No. In person. And I am thinking at a public place where food is served to other people who also appreciate it. Nia Nul: (chuckling) You mean a restaurant. (pauses) Brainy, are you asking me out? Nia Nul: The answer is yes. Brainiac-5: Excellent. See you soon. Nia Nul: You hung up before we could male a plan. (amused) Don't you think we should pick a time and place? Brainiac-5: (deadpan) Yes, of course. Brainiac-5: Let me get right to the purpose of this meeting. Nia Nul: (quirking an eyebrow) A meeting? I thought we were on a date. Brainiac-5: (stammering ) A-A-date? This isn't a date. If it were a date we'd be doing something fun, like paintball. Or an escape room. Nia Nul: Well, uh... now I feel like an idiot. Brainiac-5: I- I'm just confused. I-I-I never thought someone as beautiful as you would be interested in someone like me. Nia Nul: Ah. Well, I'm not sure that I am interested in you. Brainac-5: Clearly I've made a mess of things. (beat) Not my intention! Alex: I would give my life to save this country. You know that. But.. I can not be part of a DEO that has someone like Haley in charge. She has no morality. There's no line in the sand. Alex: There's no other way. Kara: There is! You could quit! Just leave! Get out of there! Kara: Haley's not a danger to you when you don't work there! Alex: I can't quit. You said it before. I have to stay and I have to fight this from within. Kara: Who am I without? The whole reason I became Supergirl was... it was to save you! Alex: And I'm still going to be the reason. I'm still going to be me. And you're still going to be Kara. I just... I won't know that you're Supergirl. Kara: I''ll have to lie to you every day. Alex: It's not a lie. It's... it's keeping a secret. Alex: And I'm giving you permission. (pauses) Let me save you this time. We see the Kaznian Supergirl training. The military personnel watching her discuss whether or not she can be controlled. It is said that a friend is working on that problem and that they do not intend for her to fight tanks. Kara and Lena are taking a fitness class together. Lena says it has been too long since they hung out. Lena says she and James have not really talked since their falling out at Thanksgiving. Supergirl answers a distress call from a Col. McAllister, who is in command of a Navy SEAL squad. By the time she gets to the ship, most of the SEALs are dead and Col. McAllister's body is dragged overboard. Supergirl also stops a bomb from blowing up the boat. The creature that killed the Navy SEALs was capable of camouflaging itself, appearing as only a slight shimmer even to Supergirl's enhanced senses. J'onn is shown to have earned his private investigator license and has set up an office. Brainiac-5 tries to pay J'onn to watch Supergirl's back. J'onn refuses to take the money, but promises to tell Kara he's available to be her back-up if she needs help. Alex says that she's never heard of an alien like the one Supergirl described. Alex is placed in charge of the investigation into the creature that killed the Navy SEALs. Five DEO agents besides Alex and Brainiac-5 know Kara Danvers is Supergirl. All five agree to protect Supergirl's secret identity if questioned. The Coast Guard had no record of the cargo ship that Supergirl saved from being blown up. The Navy SEAL Supergirl saved was taken out of DEO custody and disappeared. Brainiac-5 also could not find a record of any Colonel McAllister in the open records of the US Navy or any of the secret Black Ops files the DEO could access. James refers to the events of 407 and how he almost blew up Shelley Island to save someone's life and how this made him realize why Lena made the choice she did to save him from being arrested in 401. James and Lena reconcile after James apologizes for rushing to condemn Lena, saying he's realized that sometimes the ends can justify the means. J'onn has not encountered an alien like the one Kara described but he has kept copies of all his records from his time as Director of the DEO. Alex had a lot of parking tickets before she joined the DEO that showed up on her pre-employment background check. Kara finds a transfer form for aliens of unknown origin called The Morae. They have a natural cloaking power that makes them invisible to most forms of light. The requisition was made by a General Alfonso Tan. Kara remembers the name General Alfonso Tan from a different report, where he was named as the Chief Commanding Officer of something called Project Morae. Control of the project was handed over to Col. Randall McAllister in 2012. Col. Haley was also a part of the project. General Tan reveals that the US Government found four Morae as children and raised them as assassins. They had a 100% success rate. After Supergirl was dismissed from the DEO, President Baker issued an order that all ties with alien personnel were to be cut immediately. Col. McAllister was given the order to kill the Morae agents with an ambush, but they saw it coming and killed the SEAL team meant to terminate them. General Tan is killed by the Morae. Alex shoots one of the Morae that came after Tan to death. The second Morae kills itself rather than go back to the DEO. Col. Haley denied having anything to do with Project Morae for years or knowing who Col. McAllister is until Alex confronts her over the fact that General Tan is dead and the Morae killed him. According to Col. Haley, the standard protocol for government treatment of tender-age aliens is to use trauma as a method of discipline and obedience. The logic was that if the aliens feared their human handlers, they would obey them. In the case of the Morae, it worked up until General Tan gave the order to kill them. Nia thought Brainiac-5 was asking her out. He was actually wanting to talk to her about partnering with Supergirl as a crime-fighter. Brainiac-5's idea of a fun date involves paintball or an escape room. Brainiac-5 says that he once walked a dark path and was arrested. He was then given the option of using his intelligence to serve society as a superhero. He claims to now relish the responsibility and burdens of being a superhero and doesn't regret his decision. Brainiac-5 gives Nia a binder full of costume ideas and potential code names. James was part of the Kappa-Pi-Tau fratority in college and won a bake-off contest they held. Lena tells James that she is close to being able to give people superpowers. She asks James to be the angel on her shoulder as she figures out what to do with this. He agrees. The use of lethal force is against official DEO policy. Col. Haley overrides Alex's orders on this in regards to fighting the Morae, authorizing the use of real guns rather than stun guns. One of the DEO agents breaks and tells Col. Haley that Kara is Supergirl. One of the Morae is killed. Supergirl is able to force the last one into a cell at the DEO. Alex knocks-out Col. Haley as she begins talking about how she is going to recommend to President Baker that Supergirl be forcibly conscripted into working for the DEO immediately and that her life as Kara Danvers is over. Col. Haley intends to employ an alien known as a Truth Seeker while questioning the DEO agents as to who Supergirl is. Everyone who knows Kara is Supergirl who works at the DEO agrees to have their minds wiped - including Alex. Kara refers to the events of 409 and how she the Alex Danvers of Earth-1 had no idea who she was. Nia Nul has a sister named Maeve. Brainiac-5 was once interrogated for 18 straight days on the planet Venegar by a ten-eyed being known as Ik'Lorfrai'iork - The Emerald Blood-Eater. He says Col. Haley is a far more ruthless inquisitor. A weak episode full of contrivances up until the last five minutes. It's almost comical how evil the DEO and the federal government have become at this point and it speaks volumes that the comically stupid scenes of Brainiac-5 being socially awkward - which were more sad than funny in the first half of Season 4 - prove a welcome relief from more scenes of various military people insisting that alien lives don't matter and there's nothing wrong with turning alien children into soldiers. That being said, it's all worth it for the final scene of Kara and Alex together and the knowledge that we're getting J'onn J'onzz as an honest to goodness detective.